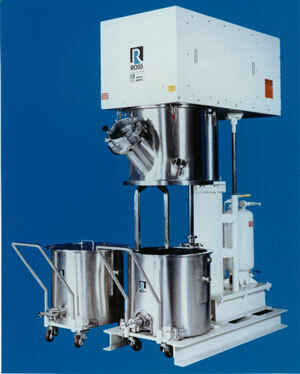 The Model PD-40 PowerMix is a change-can mixer used for high viscosity vacuum mixing and dispersion requirements. A planetary blade revolves in combination with a high-speed dispersion blade to form two separate agitation systems with one mixer. This combination is designed to allow the user to adjust the mixer to meet specific process needs and shear rates. Available sizes range from a * gal laboratory unit to a 500 gal production model.